The squadron is run by a team of fifteen adult volunteers, but how much do you know about each of them? On a regular parade night, I will handle daily administration, this usually entails spending the majority of the time filling out registers for attendance of parade nights, various activities and courses – making sure they’re regularly completed and updated. As adjutant, I’m also regularly responding to activities i.e requesting and allocating places and ensuring rentals are fully paid and up to date. Apart from the administration side, as a Sergeant I work with cadets informing them of upcoming activities, events, courses and camps whilst also staffing and supporting such activities in my spare time so cadets can attend weekend activities. I also aid in solving any cadet issues whilst ensuring compliance with air cadet procedures helping the squadron run as smoothly as possible. Outside of cadets, I work as a stress engineer at an aerospace company, I calculate stresses in detail which define requirements of structures and components such as the material thickness and weight. Preparing these detailed calculations ensure that components meet lifetime expectations and fulfill their purpose. How did you find out about the Air Cadet Organisation? 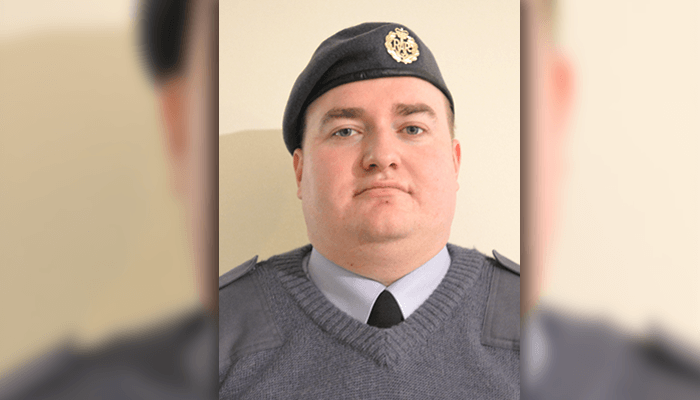 I originally found out about the Air Cadet Organisation through Flying Officer Draper, who was my flatmate at university and a ex-cadet of 2497 (Cosford) Squadron, his involvement with cadets encouraged me to become a part of it too. Did you do any work inside the Air Cadet Organisation before becoming a part of our squadron? No, I was never a cadet, staff member or a part of the RAF before undertaking my current position. I started a fresh with a supportive staff team surrounding me and I learnt all the requirements from scratch including tasks such as drill, uniform preparation and commands. It was certainly a challenge to fit in to begin with but over time I’ve benefitted from a personal and professional perspective and have gradually become increasingly comfortable and confident. Why did you choose to take on the role of Adjutant? Originally, Flying Officer Preston was the squadron’s adjutant and he guided me into the role which I’m very grateful for. Over time I have adjusted gradually into the position and have benefitted greatly. The main thing I appreciate is having the ability to interact with a vast majority of cadets at the squadron and have a large input in their social lives benefitting them all as individuals; however, it is an aspect I’d love to do more. I’m also able to provide and give opportunities to cadets in the form of activities, courses and camps which enables them to improve and learn skills, have new experiences and increase their involvement with the Air Cadet Organisation, allowing them to make the most of their spare time. What are the main challenges of your role? What have been your largest hurdles you’ve had to overcome? There are a few small challenges associated with my job which I have to overcome, the majority of which take time, but the main hurdle I’ve had to face is the skill of being able to support a full-time role in civilian life whilst also fulfilling my requirements within the Air Cadet Organisation to the best of my ability. It can be quite hard to maintain a life balance and organise my spare time around the two commitments. What are the main advantages that make you want to volunteer for us? I gain a large quantity of satisfaction and pride from seeing the positive impact I can have on cadets not only in cadets but in their personal life too. The Air Cadet Organisation can be a large proportion of some cadets’ lives and as staff, I can have a large input and benefit cadets directly and personally. Not much, but as we stand the squadron is supported by a core team of volunteers and the money is raised yearly by the cadets themselves. If there was an expansion in numbers of adult staff members, we would be more flexible and have a greater potential as a squadron. More staff support would allow us to provide more cadet related activities both on a parade night and during weekends as currently, we face a shortage which occasionally leads to a few activities being cancelled or prolonged to a later date. Another aspect is the funding, the majority of which is currently provided by the cadets without which, the squadron would have no capability to sustain itself… it would always be an advantage to have an unlimited budget. Over the past 3 years I’ve learnt and grown as an individual and become more confident and outgoing, in many ways as a staff member I have benefitted as much as the cadets themselves. I recommend volunteering as a staff member to others, no matter what current knowledge or experience they currently have, the cadet environment provides a platform to work up from and my involvement has certainly had a positive effect on my professional, personal and social life. What are your main experiences that have occurred whilst being involved in the Air Cadet Organisation? The Air Cadet Organisation has provided me with lifetime memories which have shaped me as an individual and have certainly had a large impact on my social life. Project Propellor was certainly a highlight providing the opportunity to meet multiple World War Two veterans, as well as members of the Great Escape. I’ll certainly remember these events for many years to come. But it’s not just the large events that are special, even the smallest aspects of cadets can be largely rewarding such as seeing cadets’ faces after coming back from flying or even the regular parade night – especially those in which I have more interaction and time with the cadets themselves. It seems that my involvement with the Air Cadet Organisation is a large experience in itself. Worry less about emotions and more about being a cadet, make the most of the time whilst it’s available. Apply for everything even if you don’t think it will go well as you don’t know what you could gain from it. Be more prepared and organised, plan ahead for events and please don’t hand me soggy TG forms! But if anything else, have more faith in yourselves. Is there anything else you wish to achieve? Having no paperwork would be a huge bonus and having free parade nights to spend with the cadets. But in the future, I would love to eventually become a drill instructor and potentially have enough confidence to become a Range Conducting Officer.